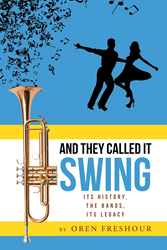 Recent release “And They Called It Swing, Its History, The Bands, Its Legacy” from Page Publishing author Oren Freshour is both historic and entertaining; this work depicts the author’s memories and research on the history, influence and power of Swing and Big Band music. Oren Freshour, a Veteran, husband, father, retiree, music enthusiast, devoted writer and author, has completed his new book “And They Called It Swing, Its History, The Bands, Its Legacy”: a unique work that gives readers the complete history of Swing music. This work is written for the generation of people who remember when, and for the generation that can carry on the memory of an iconic genre of music. Published by New York City-based Page Publishing, Oren Freshour’s profound work is the perfect read for any music lover or history buff! In this book the author gives the complete history of Swing music and Big Bands from it's beginning to its place in the world today. It tells where it began. When it began. How it spread and grew to become America's number one popular music in the 1930’s and 40’s. The names and dates of the originators, the players, the bands, the composers, the arrangers, the side men, the hit songs, they are all here. It tells the story of Swing music’s role in radio, and the history of disc jockeys. It tells how Swing music helped the recording industry and how records helped the success of name bands. The book also explains Swing’s effect on the nation during its years of popularity. It tells how during the time of segregation, the youth of America cared little about the color of Swing bands and their musicians. It tells how during the great depression, the youth of that period became crazed with Swing similar to how Rock and Roll swept the youth during the 1960’s. It tells how those same young people, who would later be called the Greatest Generation, spread the music around the world while fighting WWII. It tells how and when Swing broke the color barrier in music despite living in a nation of segregation. Swing and Swing bands were instrumental in proving segregation had no place in popular music long before the laws of social justice came into being. The reader who loves music and/or history will find this book informative as well as entertaining. Readers who wish to experience this gripping work can purchase“And They Called It Swing, Its History, The Bands, Its Legacy” at bookstores everywhere, or online at the Apple iTunes store, Amazon, Google Play or Barnes and Noble.